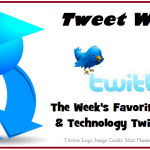 Inspiring, informative, useful, or just plain fun tweets posted on Twitter over this past week … collected here to share with our blog readers. This week … it was great to read that the White House reports high school graduation rates in the US have reached a peak of 83.2%, but it is still shocking that nearly 1 in 5 american students don't complete high school! Vicki Davis and George Couros discuss “the secret” (to effective tech integration) on the CoolCatTeacher podcast, we explore a couple perspectives on today's popular Learning Management Systems, check out 44 ways to use those smartphones in your room?, and much more! Which #Edtech Companies Are Producing the Best Research-Based Products? #GoOpen: So you've embraced OER? Now what? There is more to #blockchain than money. It has the potential to transform our lives. All the effort & $$ that goes into Blackboard, other LMS, just so Ts can share docs! Oy! Next articleCollaboration Nation Study – Calling all Educators! Good point Bryan. Unfortunately, it often isn’t practical to have a full blown LMS in place for the minority of educators who will truly leverage it, and a separate system for those requiring less, although I suppose in some large school that might work. Interesting idea. Great point about campus expense on LMSes, Kelly. Sounds like the LMS could be replaced with a basic CMS in the majority of cases, and save a lot of money.